LOS ANGELES—After a nine-season run featuring the 39th president of the United States exploring the history, manufacturing, and culture surrounding the versatile legume, Netflix announced Wednesday the cancellation of Jimmy Carter’s World Of Peanuts. 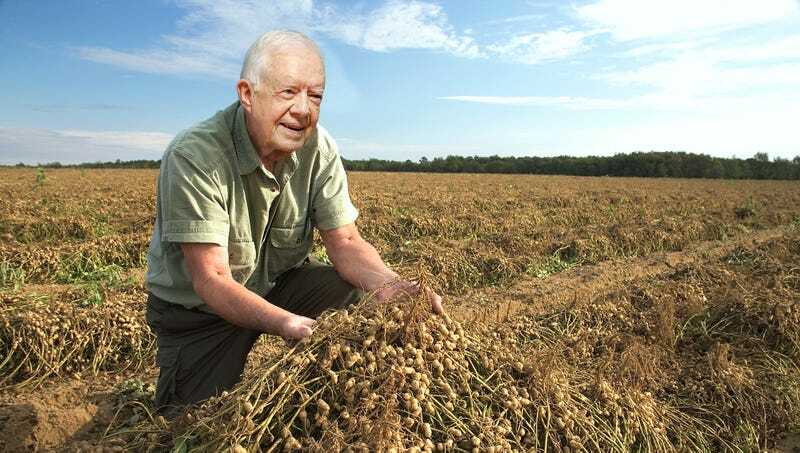 “Despite our great appreciation for President Carter’s entertaining, informative celebration of all things peanut, we have made the difficult decision not to renew the series for a 10th season,” said Netflix CEO Reed Hastings, praising the long-running agri-documentary series and its host, the homespun former commander in chief who opened each episode by telling viewers to “forget everything you know about peanuts” before launching into his weekly 90-minute exploration of peanut cultivation. “Jimmy taught audiences a whole new way of looking at peanuts, from their early use as livestock feed through their heyday as a staple of American sandwich culture, all while examining the life of peanut producers around the world through deeply human profiles and hard-hitting interviews. While we are sad that dwindling viewership means creating new episodes is no longer a viable endeavor, we thank him for his impressive work. The special episode where he visits the land where his family peanut farm once stood is a three-hour odyssey we won’t soon forget.” The decision comes less than a week since Netflix announced they were renewing both Saxophone Hour With Bill Clinton and George W. Bush’s Joy Of Painting.